To this landmark biography of our first president, Joseph J. Ellis brings the exacting scholarship, shrewd analysis, and lyric prose that have made him one of the premier historians of the Revolutionary era. 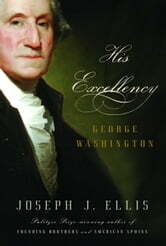 Training his lens on a figure who sometimes seems as remote as his effigy on Mount Rushmore, Ellis assesses George Washington as a military and political leader and a man whose “statue-like solidity” concealed volcanic energies and emotions. Here is the impetuous young officer whose miraculous survival in combat half-convinced him that he could not be killed. Here is the free-spending landowner whose debts to English merchants instilled him with a prickly resentment of imperial power. We see the general who lost more battles than he won and the reluctant president who tried to float above the partisan feuding of his cabinet. His Excellency is a magnificent work, indispensable to an understanding not only of its subject but also of the nation he brought into being.